A friendly reminder that we must collect all our Shoeboxes of Love by the end of this week. We are only half way to our Goal. My wife, Leah has been working and driving around tirelessly shopping for all the items needed and filling every shoebox. Thank you to everyone who has already donated cash and for those that have contacted us to let us know your intentions to bring in a shoebox already filled this week. Fill a shoebox for children aged 3 – 4 years with the essential items in the attached list, and toys, coloring books, etc. Every shoebox must contain the essential items and then you can add fun things. The value of each shoebox should be between $25 or $30. Please try to make sure that the box is actually a shoebox shape and decorated with Christmas wrap or designs. Michael’s and the Dollar Store sell pre-decorated boxes for roughly around $3, however, if they go on sale at Michael’s or you have a 50% off coupon they are a little bit less expensive. A cash donation of $30. 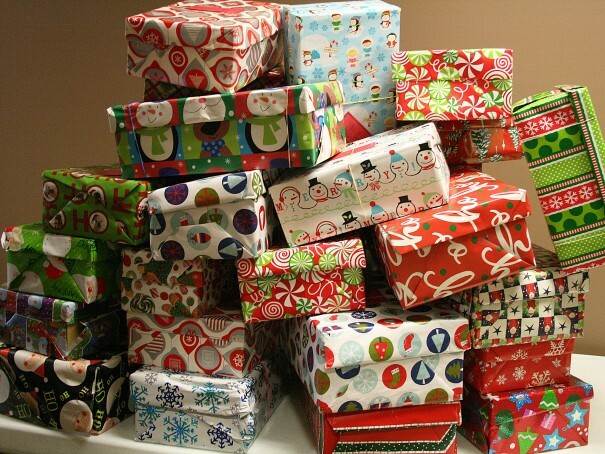 We are trying to gather enough shoeboxes for approximately 25 boys and 20 girls in that 3 to 4 year old age range. All of the children at the school will receive a shoebox, however, we are just focusing on the one age group. The school we are supporting this year is St. Justin. We need to have all donations in by December 6th please. The “Essential” list says waterproof mittens or gloves. Please ensure that no magic gloves (or other types of cloth gloves or mittens) are put into the boxes. We have been involved with this charity for 4 years and it is a wonderful organization to be a part of. Sadly, there are many children in Edmonton and surrounding area who have never received a gift, let alone a Christmas gift. The joy and excitement that these children have the day we go into their school is amazing and heartwarming. There is also a pancake breakfast the same day as the gift distribution and equally as sad is the fact that a lot of these children rarely get this type of breakfast. If you cannot contribute a full shoebox or $30 any amount you can spare would be greatly appreciated. Thank you in advance for your generosity and all of us at Precision Martial Arts Academy wish you a healthy, joyful, fun and safe holiday season. For more information or to donate, please contact Leah Kazakoff at 780-910-7657 or PMAA’s office at 780-544-9931.